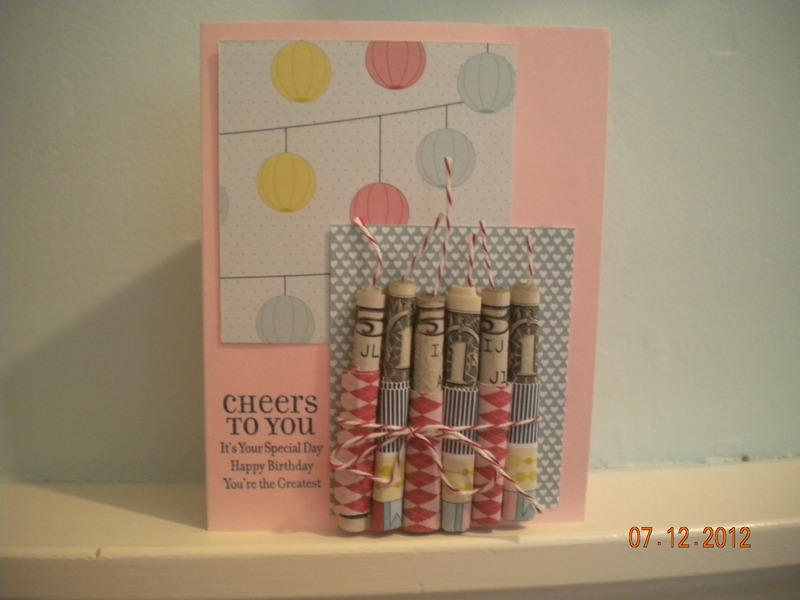 I saw this card on “Pinterest” and thought it was a clever idea. 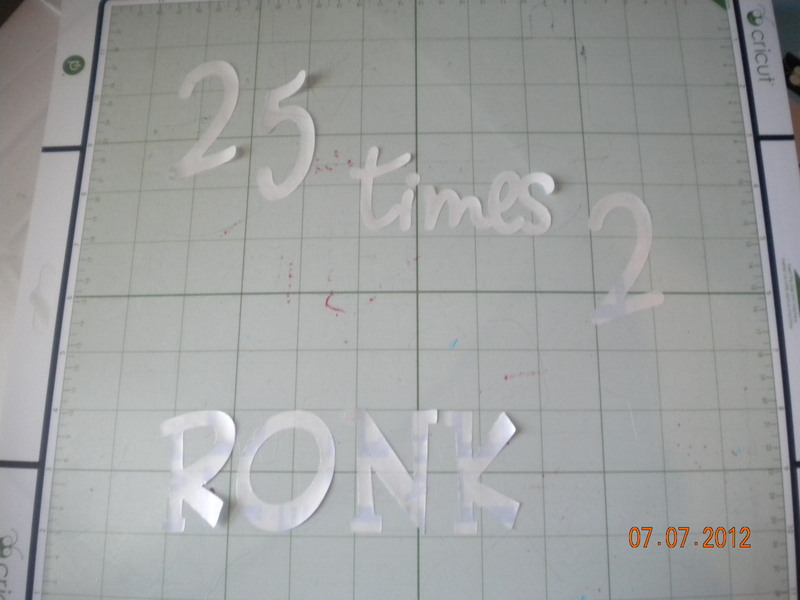 Cut the background pieces 2 1/2 x 3″ and the second piece 3″ square. 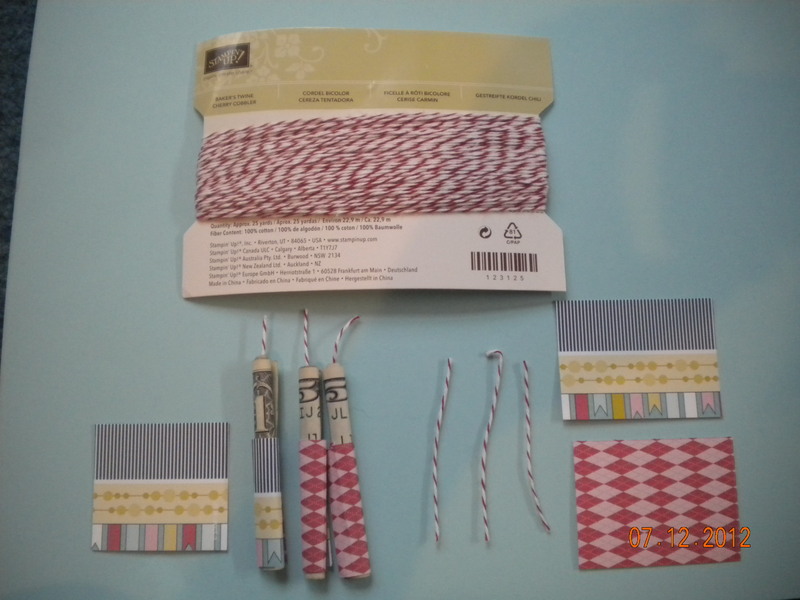 The pieces used to wrap the money in are cut 1 1/2″ x 2″. 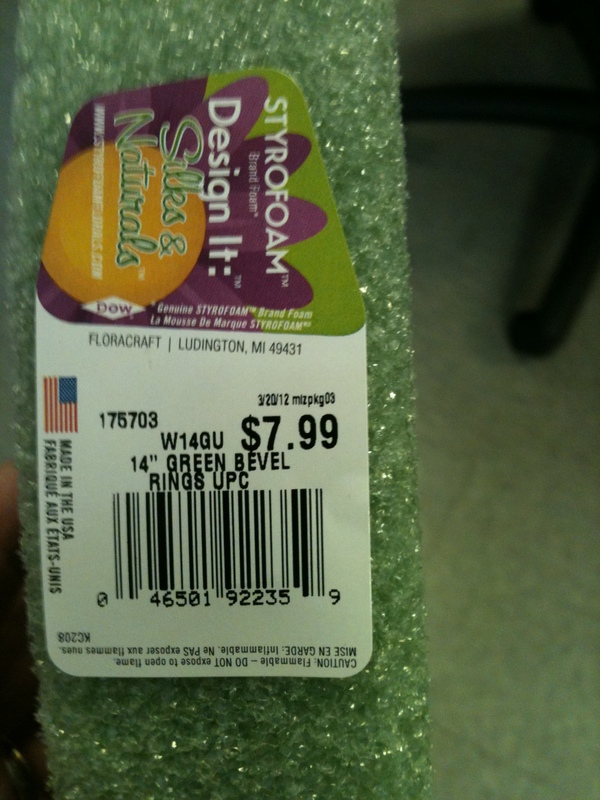 I make sure you only put the tape on the “wrap” and not on the money. 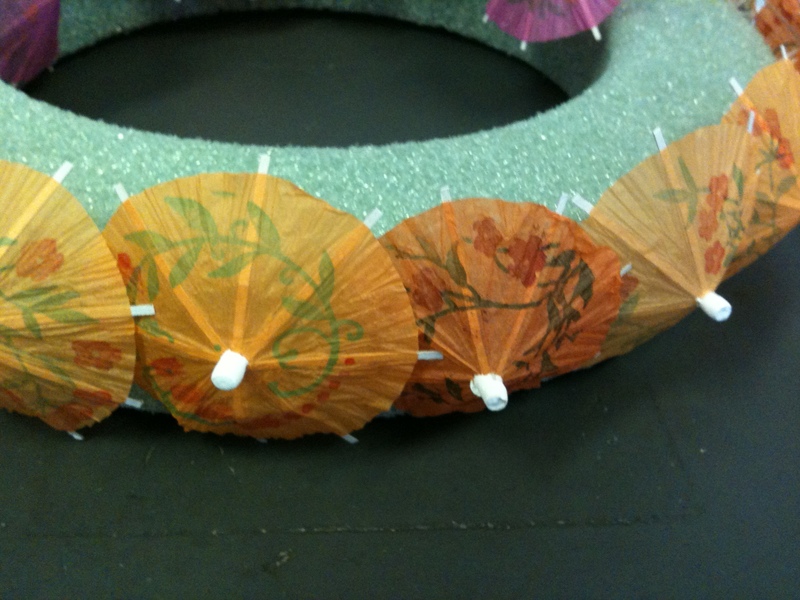 I then trimmed the umbrella’s to make them easier to insert them in the wreath. 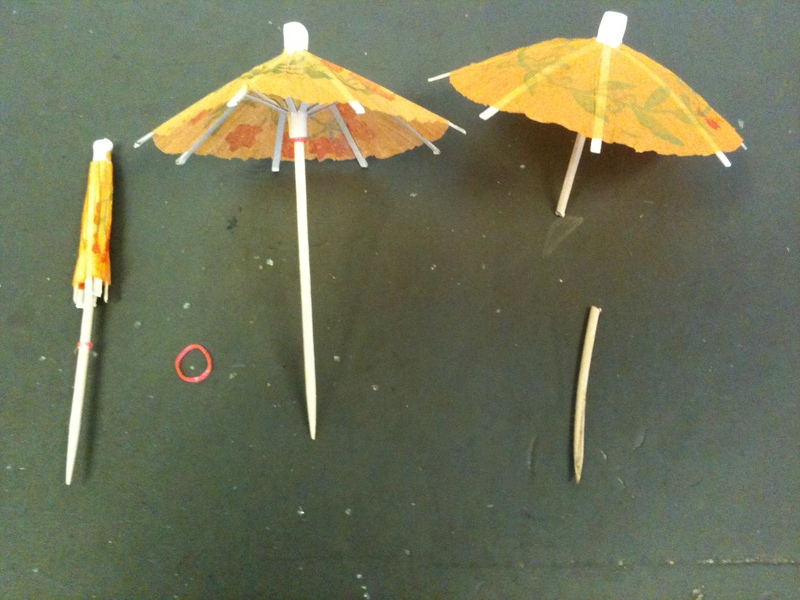 I found it easier to put all the “outside” and “inside” umbrella’s in first. The only reason mine are all the same color is because I used them for another project. I trimmed a “shell” necklace for the hangar, but forgot to take a picture for this step. 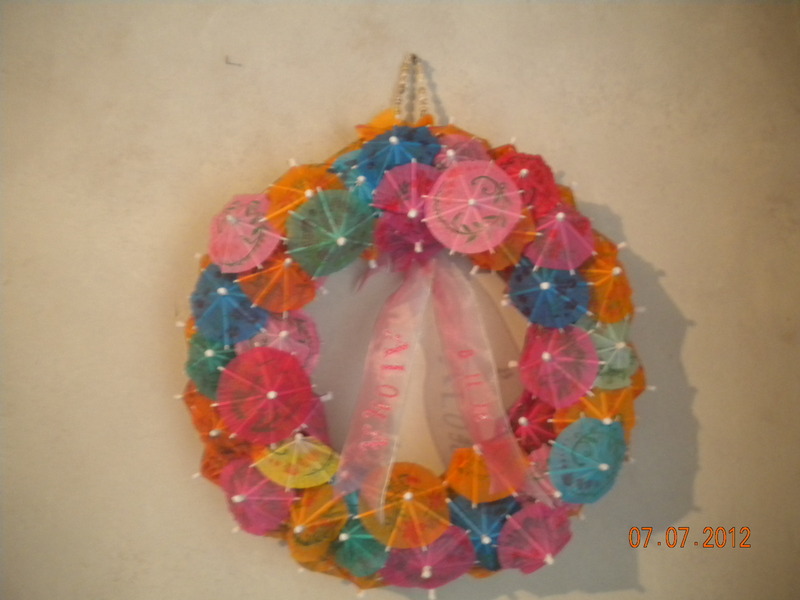 Please note: It is VERY fragile…it would not hold up in any type of wind or weather, but it is so darn cute hanging in their kitchen. Today is my baby sister’s birthday. 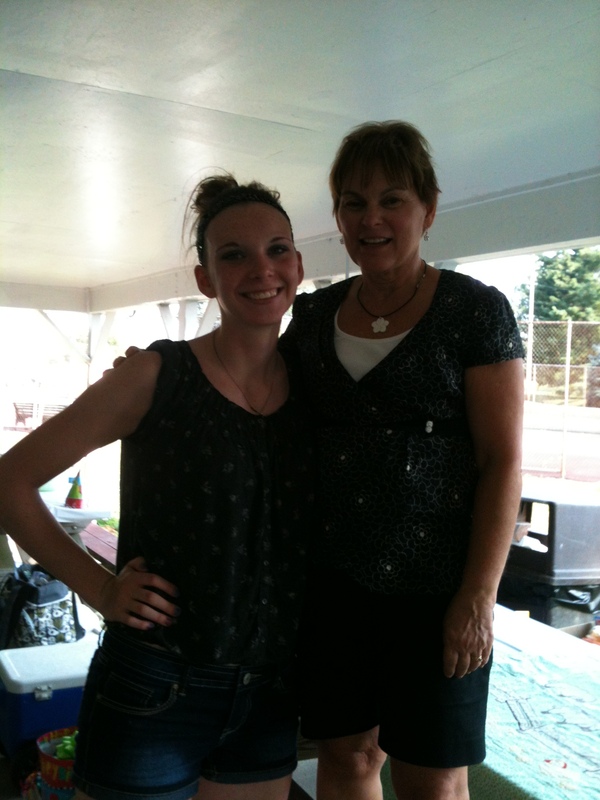 I have been thinking about her reaching the big “50” and it reminded me of my mom’s 6oth Birthday celebration. We had a big party with 60 balloons and I asked her, “What does it feel like to be 60?” and her answer to me was, “You don’t feel like 60 on the inside”. That got me to thinking….I guess you are never really happy with your age. When you are in grade school, you can not wait to get into Junior High (I am showing my age, now it’s Middle School). When your reach High School, you can not wait to get your license. After that for me it was “I can not wait to turn 18.” Why you may ask, well in the “day,” you could go to bars and drink 3.2% beer. ( If you know what I am talking about you are either my age or you have heard your parents tell you the story.) Now it’s the all important 21, that usually includes a “bar crawl”. After you turn 30, you decide you want the clock to run the other way. 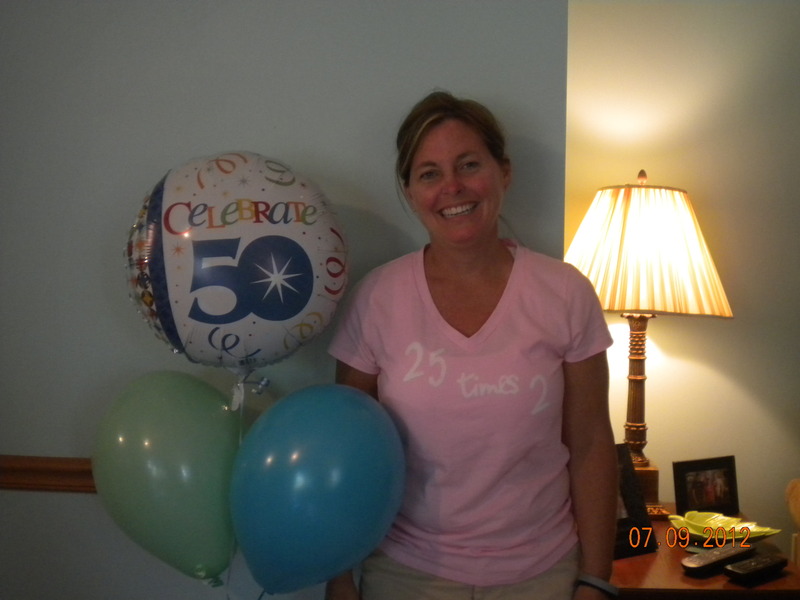 Now we would all rather be younger then our age, so that is why her shirt says “25 times 2”. Don’t get me wrong, there are some perks that go with turning 50, but I think most of us would gladly give them all up to be 25 again…. we’re still not happy with our age are we? 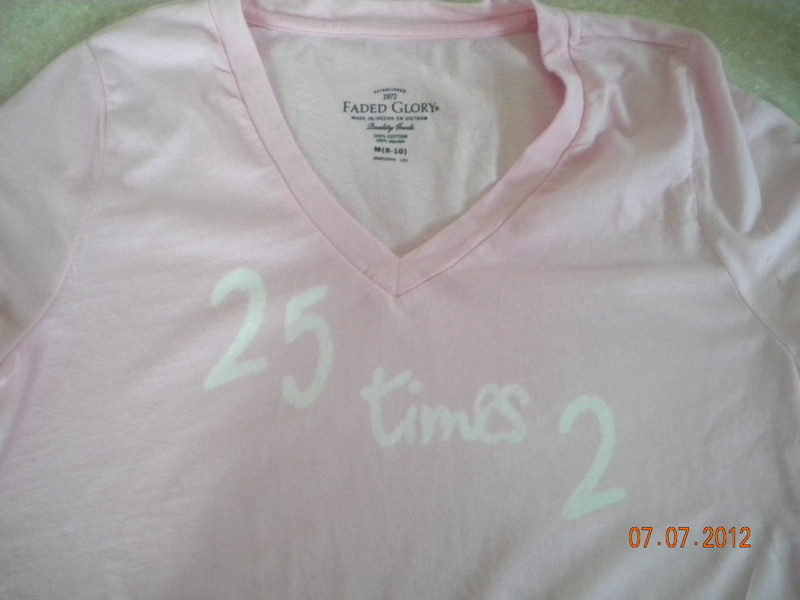 So here’s how I made her T-Shirt! 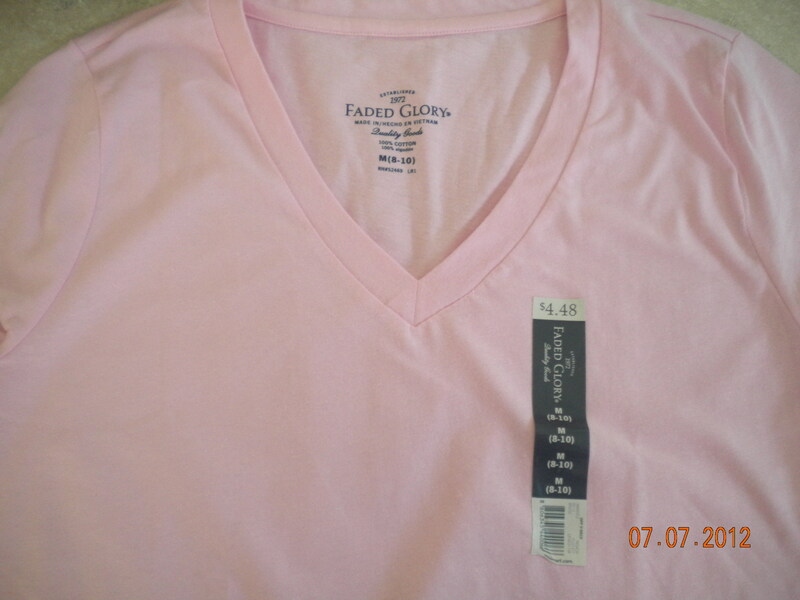 Put a piece of cardboard inside the shirt, so that the bleach doesn’t go through to the back. Peel the backing off the contact paper and position it where you want it on the shirt. 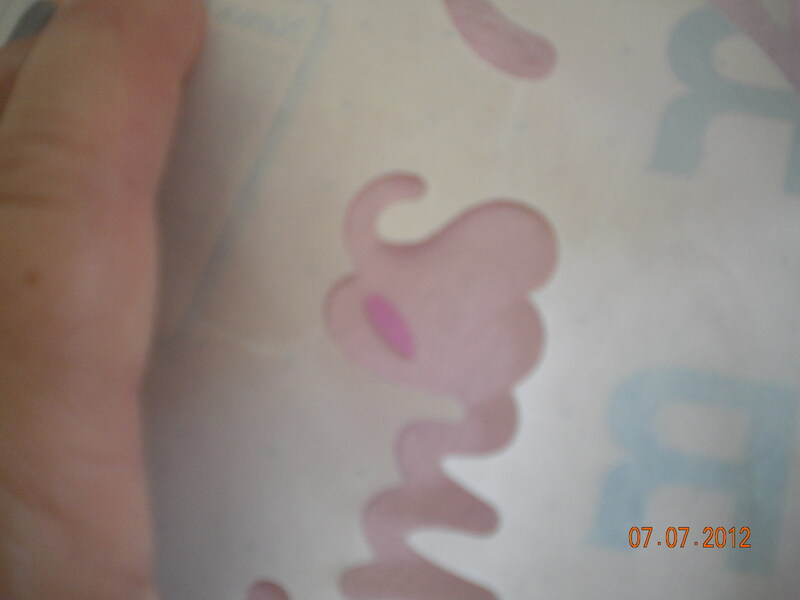 Make sure to save the little pieces that go inside the E and other spaces (shown in the picture above as PURPLE). Don’t forget to stick them on or you’ll just have a white blob instead of an E. Make sure all the edges are down TIGHT, so the bleach doesn’t run. Color the stencil in with the small end of the bleach pen. Let it set until you see the color changes. (@ 10 minutes for this color). 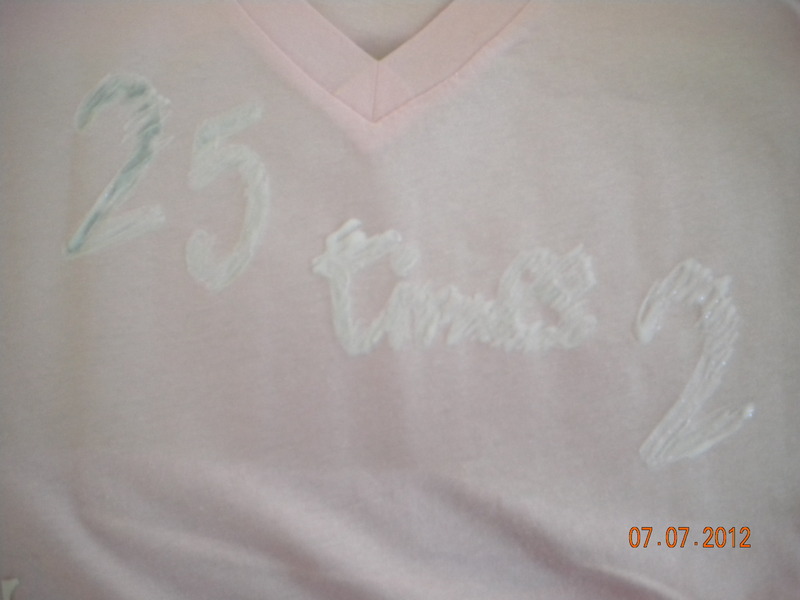 With the pink shirt the letters turned white, other colors of t-shirts will give you different results. Then I panicked… how was I going to get the bleach washed out without it bleeding. I rushed to the bathtub and turned on the cold water and ran it over the front of the shirt with the cardboard still inside. I gently rubbed the image. Then I removed the contact paper. I rinsed the shirt again and threw it in the dryer…all by itself…just in case. I don’t know about you, but I am getting darn tired of these hot days. I live in Ohio and the temps here have been over 90 for a week. So I went to my “food” pin board for today’s dinner. This original “pin” was from http://hickeryhollerfarm.blogspot.com/2012/03/crock-pot-cooking.html. You will need 3 pork chops (I used boneless and next time I will use bone in). My biggest tip is to first put a ” liner” in your crock pot. 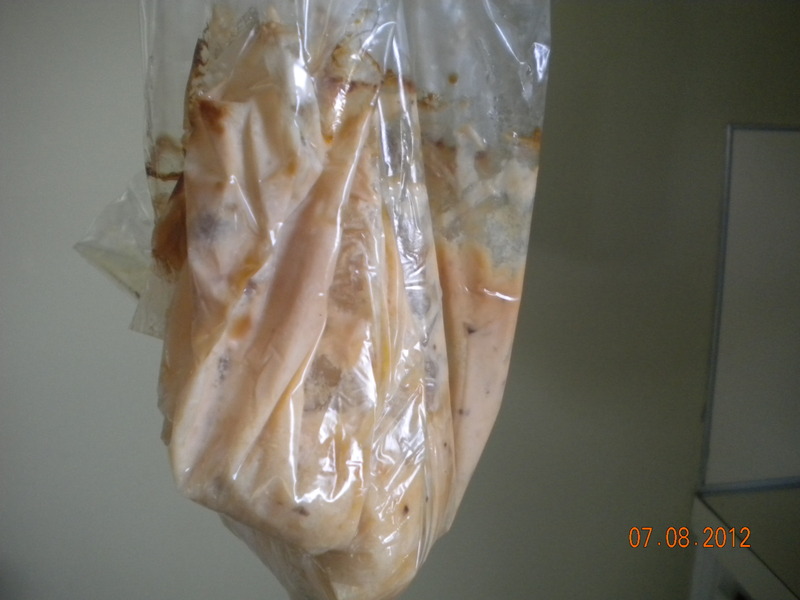 Brown the pork chops and put them in the bottom of the crock pot and cover them with a can of cream of mushroom soup. You can then add onions, mushrooms and garlic, that is only if you don’t live with my husband who would turn his nose up at any of those items. Therefore, I just added the soup. 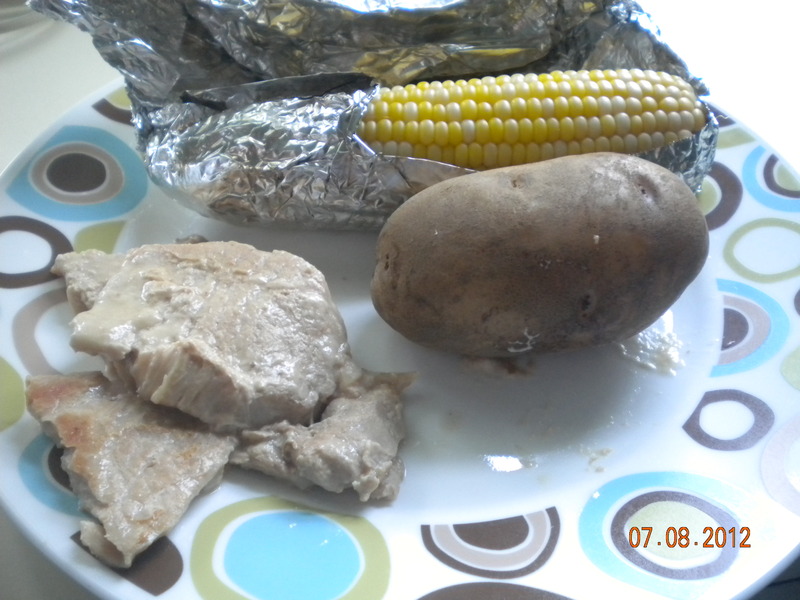 Then wrap three baking potatoes in foil and put on top of the pork chops. 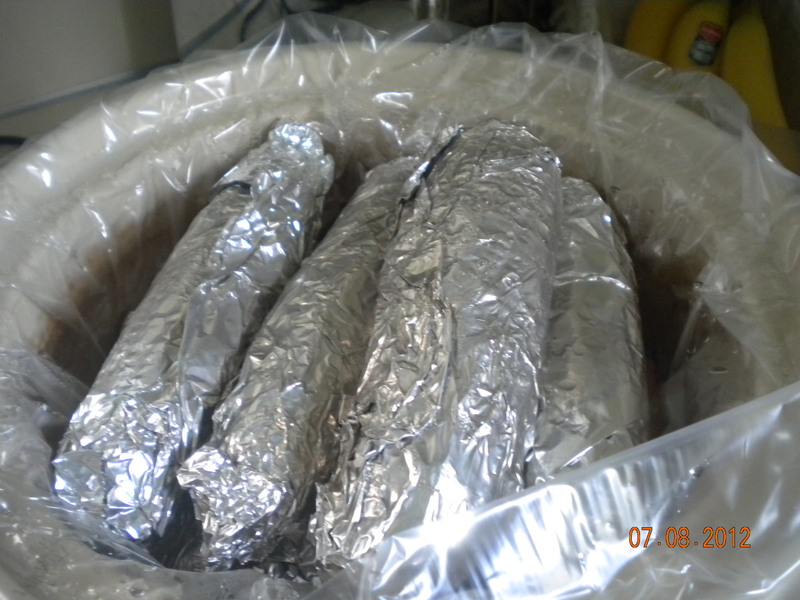 I then wrapped four fresh ears of corn in foil and placed them on top of the potatoes. Cook on low for 6 hours. Here are my results. My tips: Use bone in pork chops and the “liner” It was super easy to prepare and didn’t heat up the kitchen, which was a BIG plus. My husband even said he would like to have it again. I know this picture looks sort of gross, but it is the only clean-up you will have if you use the liner! Enjoy the smile when you give them their new pillowcase! I guess I should start this blog by telling you a little more info about myself. That 9-5 day job I will be leaving soon (the date has been moved from 7/31/12 to 8/31/12) is Postmaster of the village of Gratiot, Oh. Since Gratiot is such a small village, every has to come to the Post Office to pick up their mail. This is how I met “Moe”. Moe is a Vietnam Veteran and more importantly a Marine. He has graced me will stories of his time in the service and we have become friends. When you meet Moe, there is not a doubt in your mind that he is proud to have served his country in the Marines. He has three trucks and they are all green. He once relayed a conservation that took place between one of his friend’s , Dennis, and Dennis’ mom. It went something like this, “Dennis, there is something wrong with that Moe, all he wears are green clothes.” This is so true…army green is his color of choice. 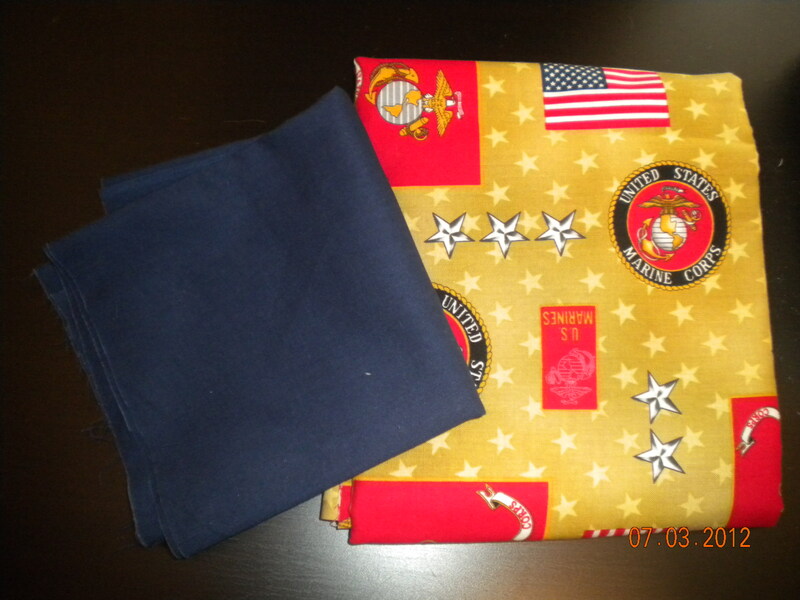 Well in March I went to a quilt show and came across some “Marine” fabric and knew I just had to get some for Moe. 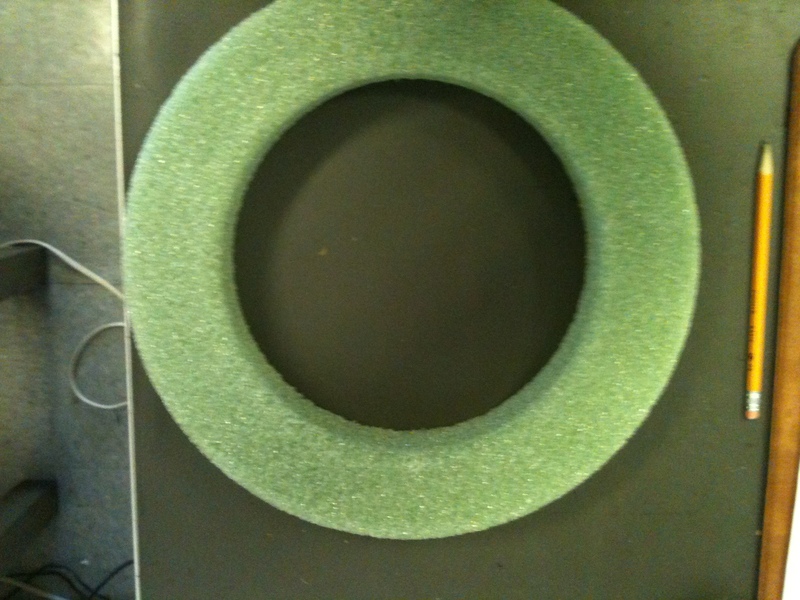 Then my dilemma was, what to make. 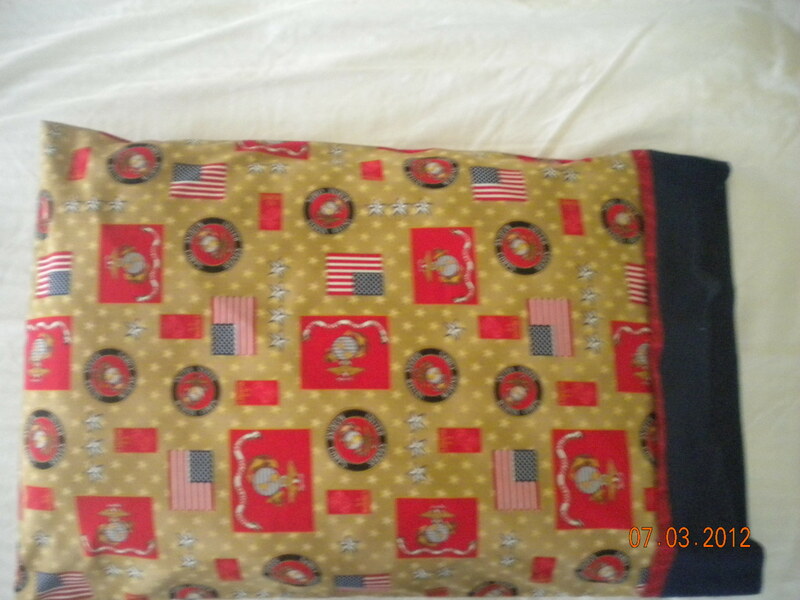 Well I had been given the instructions for an easy pillow case, so I rummaged through the mess I call my sewing room and believe it or not, I found those instructions. I work better by seeing, than by reading, so I had to scratch my head a few times while I figured out the directions and then it was an easy pillow case with no raw edges, which I loved. So fire up your machine and let’s make “Moe” a pillow case. 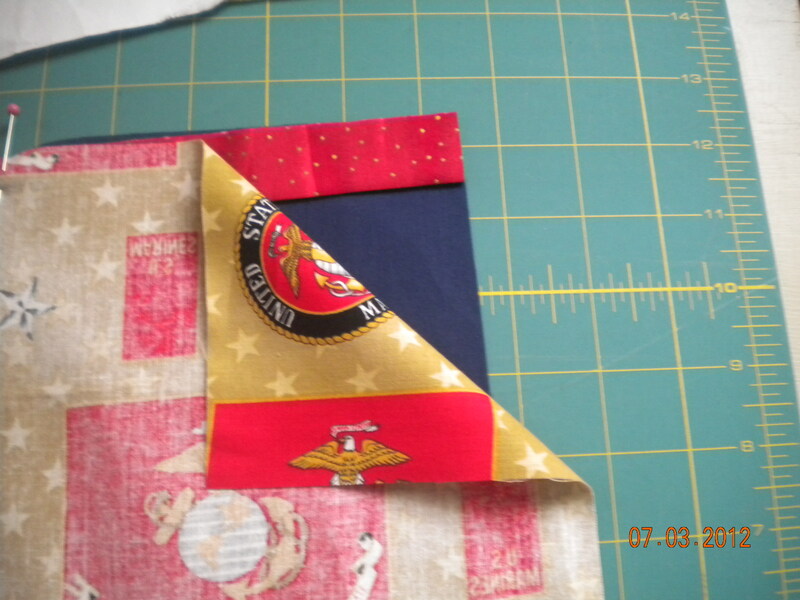 Unfold and press the 3/4 yard piece of fabric. Place on top of other pieces with WRONG side facing up toward you. Line up raw edges on the top. Pin the 3 layers of fabric in place. Now comes the FUN part…(those are their words..it was a head scratching experience for me…If I suffered from dandruff, it would have looked like a blizzard had hit!) 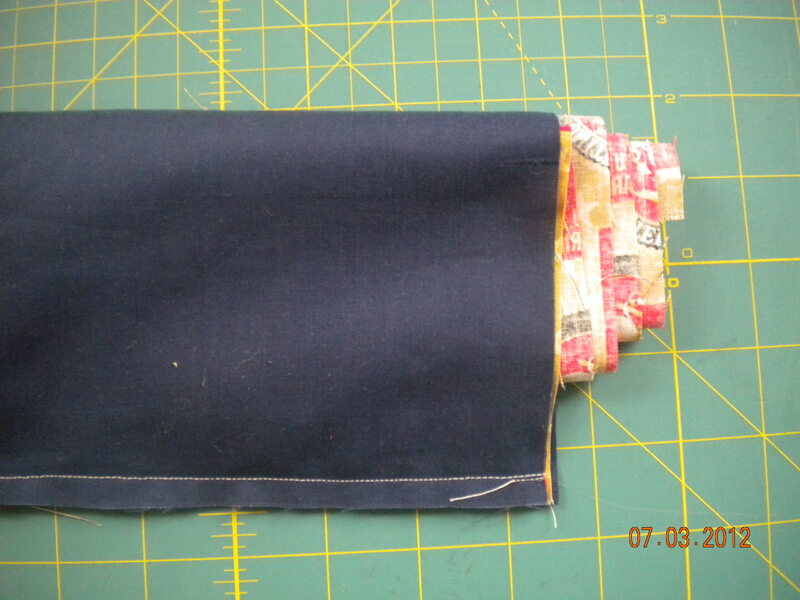 Roll or fold the remaining length of the 3/4 yard piece up towards the top raw edges. 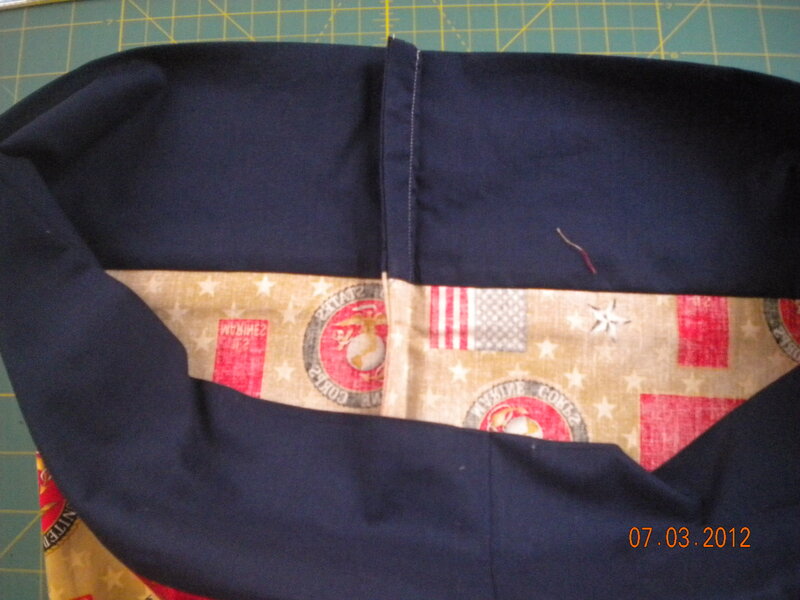 (Note: the wrong side of the fabric should be facing you) Pin in place lining up with the raw edges. 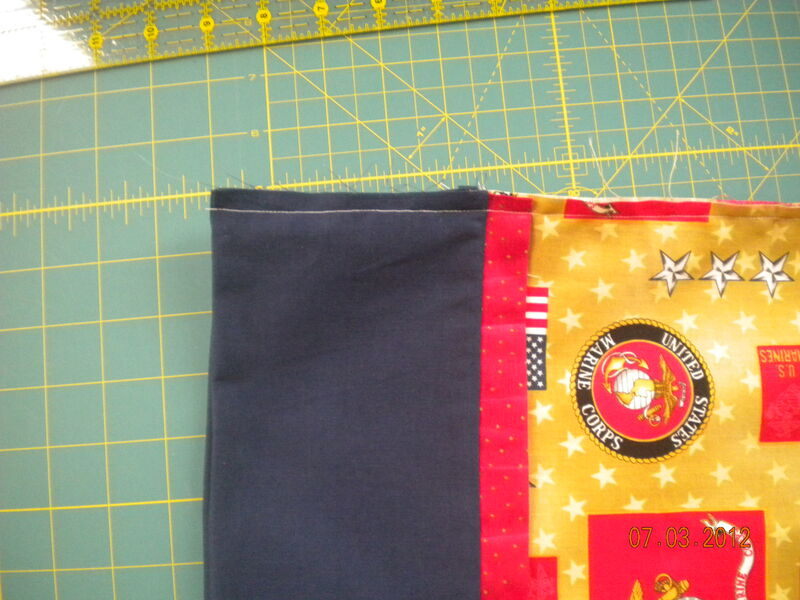 Machine stitch all pieces along the top raw edges using 1/4″ seam allowance. 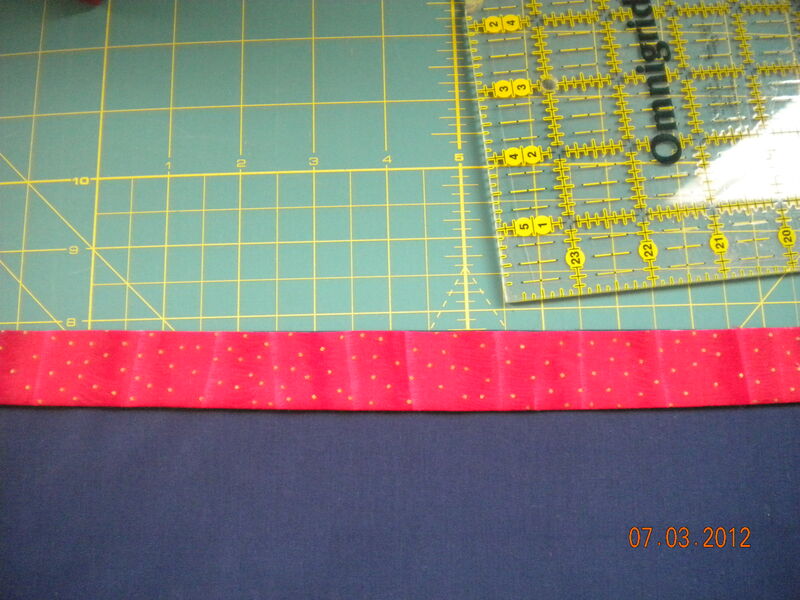 Be sure to back stitch this seam. Turn the entire roll of fabrics. 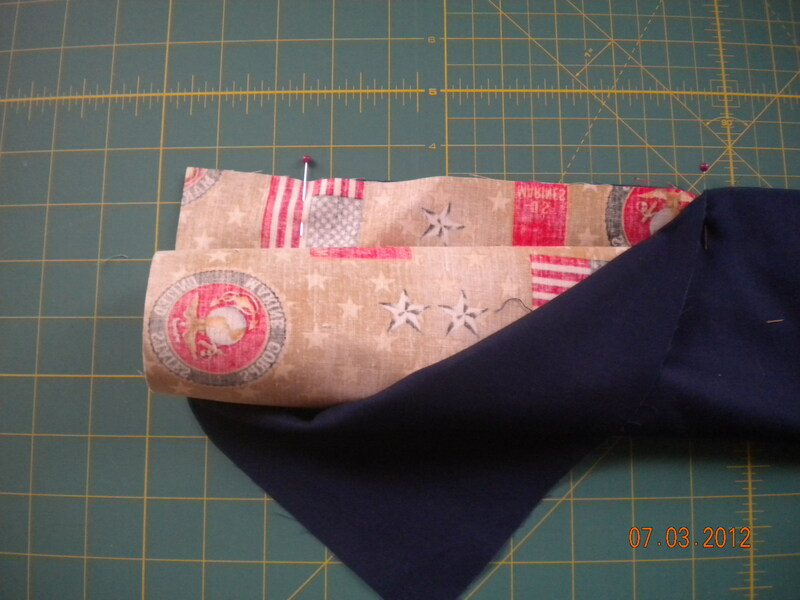 You should now have the pillowcase cuff in place with no exposed seams. Fold project in half (WRONG sides together) with the pillow case cuff edges together. stitch side and bottom using 1/4 ” seam allowance. 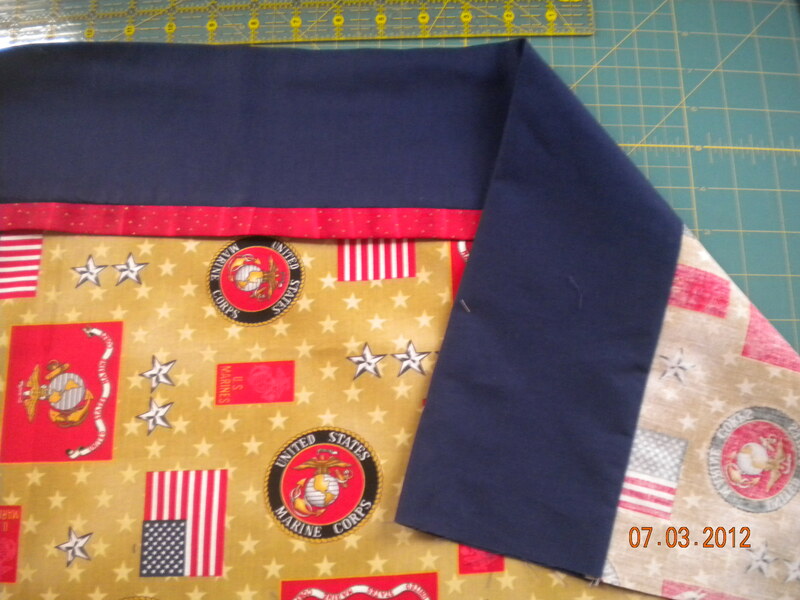 Turn inside out with the RIGHT sided of the fabric together. 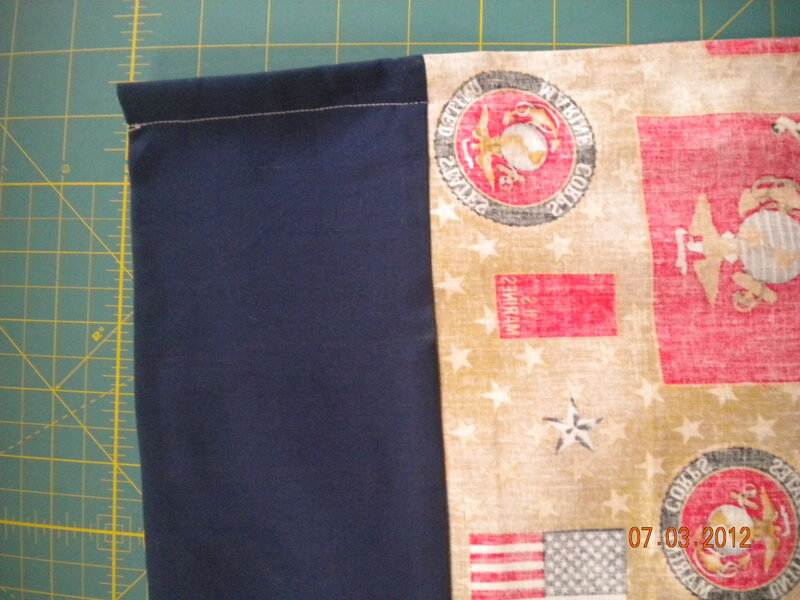 Stitch the seams again using a 1/2″ seam allowance. Be sure to back stitch. We just found out that my nephew Cameron and his new wife, Jenna will be moving to FL. Jenna was just hired as a librarian at a College. I just had to make her a card. Congratulations Jenna!! Ok, I’ll admit it, I’m a “Pinterest” addict. The first thing I do at night is log on and start looking for “pins”. I can not sleep because of all the project going through my head. 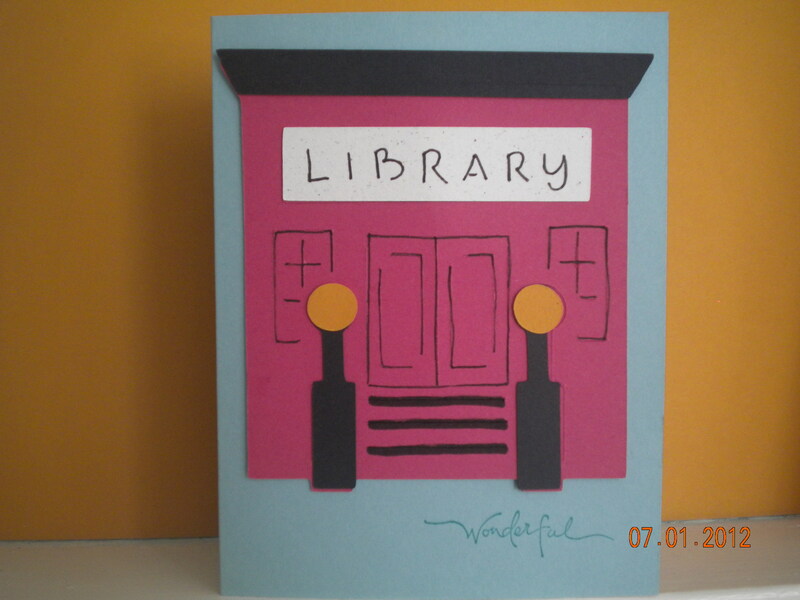 Therefore, I am starting a new Category on my blog. “They pinned it, I tried it”. I will post the successes, failures, tweaks and the lessons learned while completing my “Pins”. On June 29, 2012 a huge storm ripped though Zanesville, Oh. Many of our residents lost power and had downed trees and wind damage. 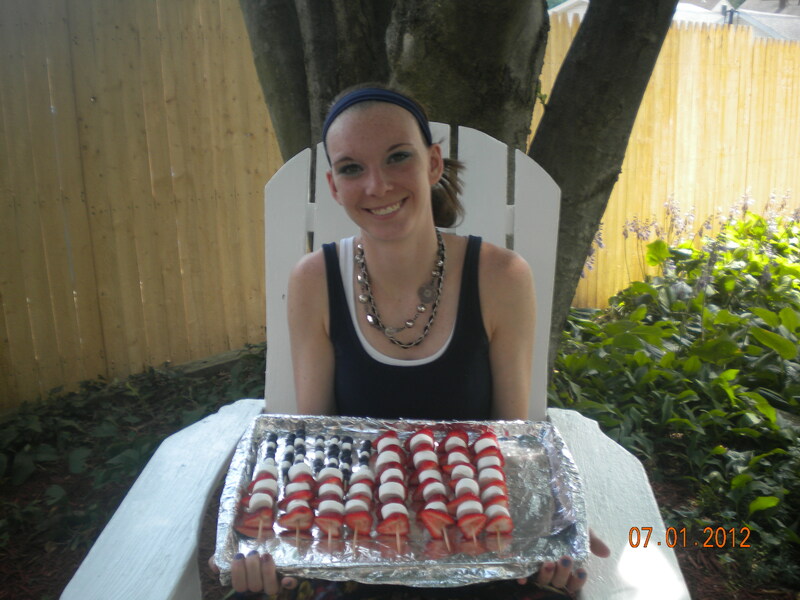 We were lucky and never lost our power, but my great-niece, Cassidy, was not as lucky. Her mom and both of her Grandmas were without power. So Cassidy spent the night with us. She is (almost) 18, so of course she is up on all the new technology. She helped me set up a “Facebook” page and we surfed the net for ideas. My sister-in-law, Kelley, was also without power and had a huge party planned, so we decide to try a “Pin” for desert. 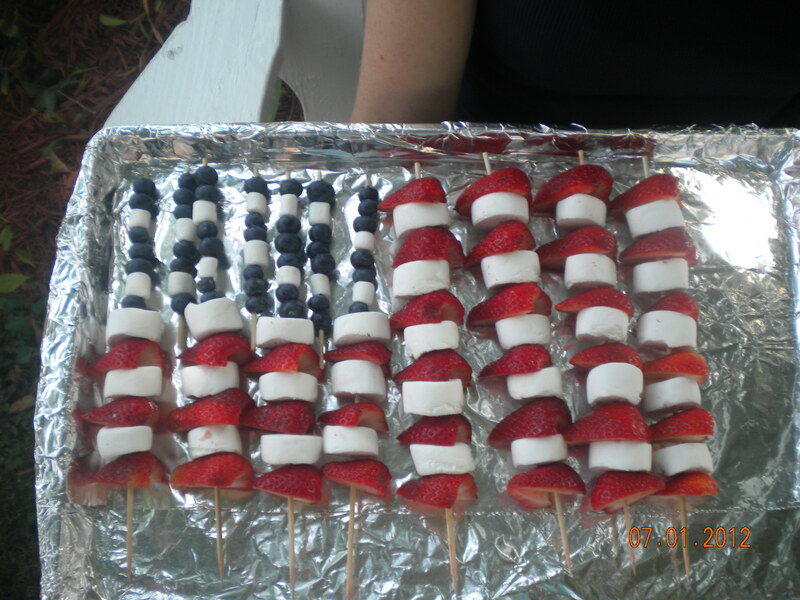 Since it was close to the 4th of July, we chose the “Fruit Flag”. We did tweak it a bit from the original “Pin”. My daughter, Ashley, thought the bananas would not be a good idea since they would probably turn brown in the heat, so we choose regular marshmallows and cut them in half. Cass’s idea was to add small marshmallow for “stars”. 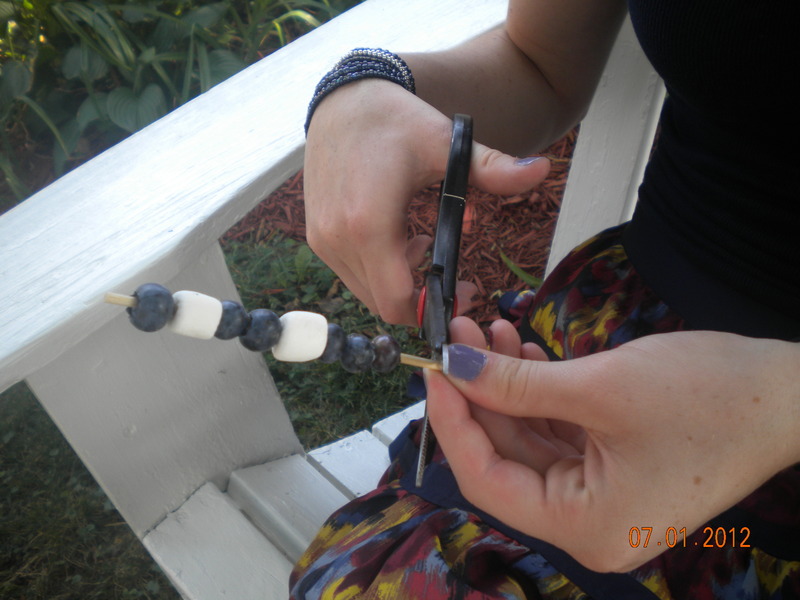 The suggestion at the party was to try “cheesecake bites” in place of the marshmallows…next time! We just got home and it was a hit!